When thinking about food in Baltimore, the first thought should be crab; crab cakes, crab soup, boiled crab seasoned with Old Bay. Crab is the iconic food of Maryland, but if you move just past it, once you have had all the crab cakes you can take, you find pit beef. Pit beef is almost the opposite of crab. Although crab is often refined, pit beef is always casual. Although the flavor of a crab cake is delicate, pit beef is pronounced. Pit beef is grab and go food for the working man and in that sense is more authentically Baltimore than even the well known crab. 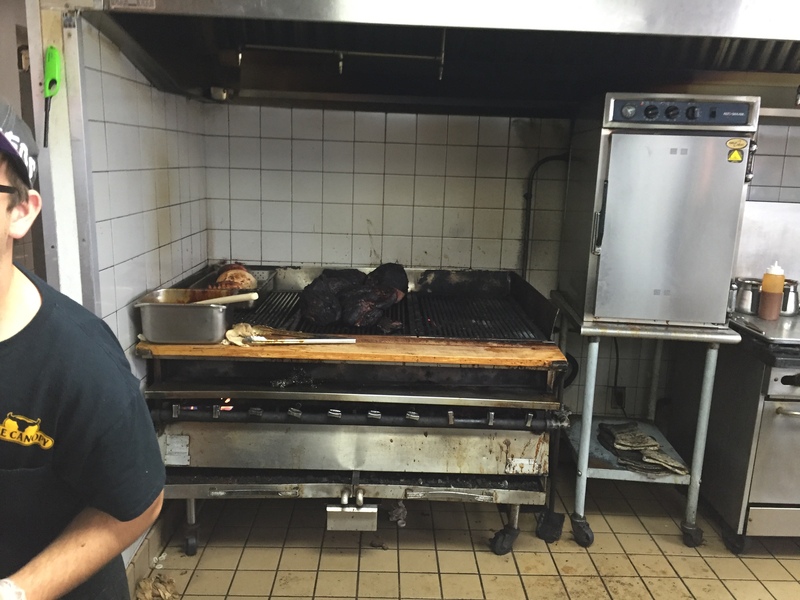 Pit beef is made by cooking a large beef roast over an open fire. The meat comes out with a dark black crust that frankly isn’t too appealing to look at. You choose doneness and toppings and then the meat is sliced to order and served on a bun. I travel to Baltimore for work a few times a year. This has been going on for about five years now and even though I have known about and wanted to try pit beef all those years I have never been able to, mostly because of arranged meals and a busy schedule. My hope has always been to get to Chaps or Pioneer, two of the most famous pit beef stands. But this trip I decided to stop being particular and just make it happen, I didn’t care where. 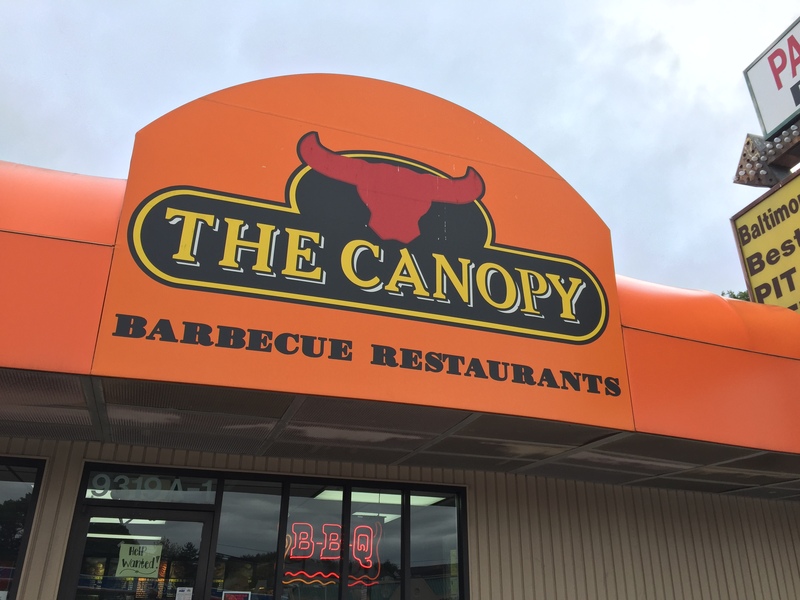 It was this attitude that caused The Canopy to be my first pit beef experience. It was close to where I was staying and open on Sunday. I didn’t choose it for any other reason. There aren’t seats, just a small counter that a few people could stand at. It’s not the nicest place to look at but I didn’t go for the décor. The sandwich was good. It is very similar to a New England roast beef, only freshly cooked. The flame imparts a little extra flavor. I ordered mine with Tiger sauce, a mayo horseradish blend and raw white onions. Both give the beef a little extra kick. My biggest complaint would be that I ordered it rare and it was medium at best. 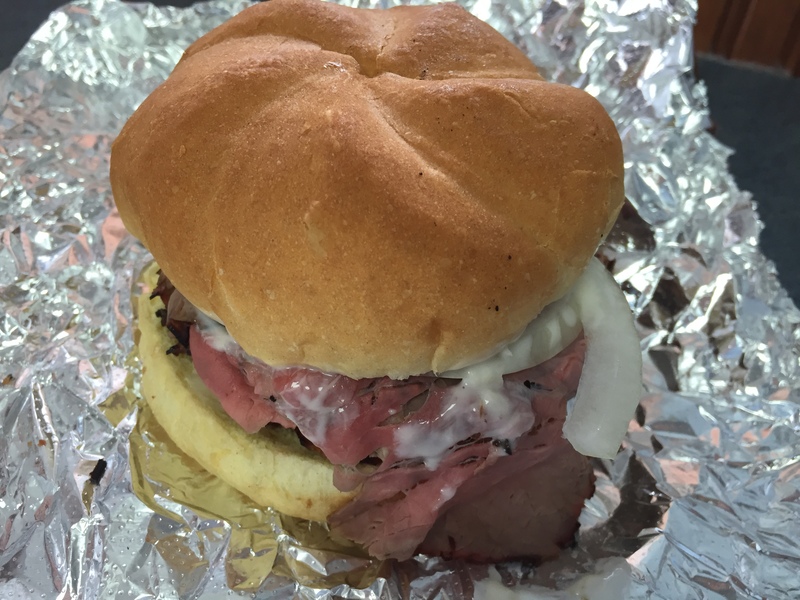 In New England any roast beef sandwich you get would be rarer than this one. I saw a medium and it was cooked all the way through, no pink. I know I will be back in Baltimore plenty more times. I look forward to becoming an expert in pit beef. I want to know what it is that makes people love this sandwich so much. I’d especially like to try some of the more popular stands. Right now, even though I think pit beef is good, it’s just not all that special.